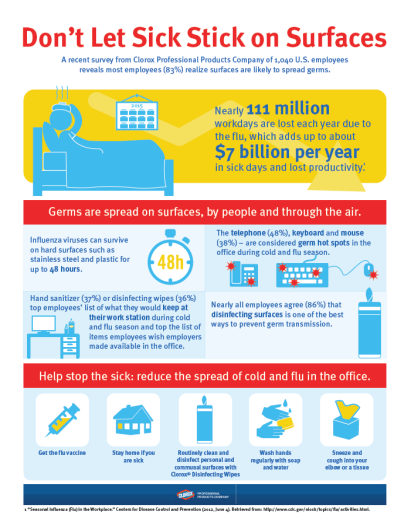 As the flu season ramps up, this is the perfect time to remember common cleaning practices, in addition to vaccinations that are effective in preventing the spread of influenza and the common cold, such as disinfecting shared surfaces.A recent survey from Clorox Professional Products Company revealed that nearly 111 million workdays are lost each year due to the flu, adding up to about $7 billion lost in sick days and productivity per year. Additionally, according to the CDC, the common cold is the main reason that children miss school and adults miss work.Influenza viruses in particular can survive on hard surfaces for up to 48 hours, therefore, it is essential to disinfect frequently touched surfaces to prevent germ transmission and preserve public health. To ensure this, cleaning professionals can turn to commercial cleaning products and disinfecting wipes that are Environmental Protection Agency (EPA)-registered to kill these illness-causing germs.